For information in German please scroll down. 100 years since the end of German colonial rule in Namibia in 1915, the relationship between the former colonial power and the Namibian communities who were affected by its brutal colonial policies, remains problematic. Namibia has enjoyed good relations with Germany since Independence in 1990, and Germany has provided the highest amount of foreign aid to the country. Some of this has been directed to communities affected during the German colonial period. Yet interpretations of the past are still contested. 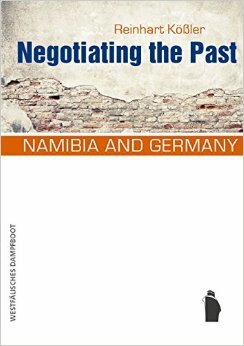 NEGOTIATING THE PAST: NAMIBIA AND GERMANY explores the relationship between Namibia and Germany in the post-colonial era by examining the ongoing debates, conflicts and confrontations over the past. The book frames the national historical narrative with particular reference to the Namibian War of 1903-1908 and the genocide perpetrated by the German colonial army. Part I of the book describes the country’s violent colonial experience and its consequently diverse and unequal society, with a dominant historical narrative captured in Windhoek’s architecture. It explores diverging memories of the past through both Namibian and German perspectives within the field of memory politics where assertion, commemoration, denial, amnesia and recognition are the central themes. Part II explores the resilience and resistance of central and southern Namibian groups, who assert their respective historical roles and current aims in independent Namibia through commemoration of their traditions in annual festivals. Part III confronts the contentious issues of apology, restitution and reparation, looking at post-colonial processes of explicit and implicit negotiation, and conversations between relevant actors both in Namibia and Germany. 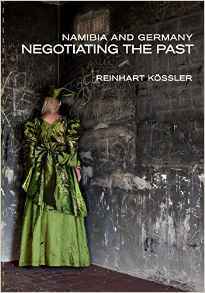 For lasting reconciliation and mutual respect, Kössler advocates active engagement with, and recognition of a ‘dire past’, despite breaks in communication and refusals to understand, and even in the face of the challenging and far-reaching implications of truth-seeking. 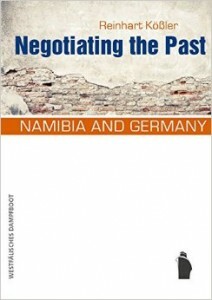 About the author: Reinhart Kössler, a German scholar with wide-ranging personal experience in Namibia, scrutinises the consequences of German colonial rule, its impact on the descendants of victims of the genocide, Germany’s historical responsibility, and the ways in which post-colonial reconciliation might be achieved. The English book was published by University of Namibia Press. See the announcement here. Please see information about the launch of the book here and here. Zu den blinden Flecken der deutschen Erinnerungskultur gehört der Völkermord in Deutsch-Südwestafrika, dem heutigen Namibia (1904-1908). In Deutschland vergessen, ist dies Geschehen den Nachkommen der Opfer und Überlebenden in Namibia präsent. Daran schließt sich ein asymmetrischer Konflikt. Es geht um Anerkennung, Entschuldigung und Entschädigung, aber auch um das Schicksal menschlicher Überreste, die zu rassekundlichen Forschungen nach Deutschland gebracht wurden. Über den Autor: Reinhart Kößler, geb. 1949, arbeitet am Arnold Bergstraesser-Institut Freiburg und ist apl. Professor am Seminar für Wissenschaftliche Politik der Universität Freiburg; , Mitbegründer und Redaktionsmitglied der Peripherie. Interessengebiete: Gesellschaftstheorie, Entwicklungstheorie, Institutionenpluralismus und Ethnizität, postkoloniale Erinnerungsspolitik, Menschenrechte. Das Buch (in Englisch) erschien im Verlag Westfälisches Dampfboot. Weitergehende Informationen und Inhaltsverzeichnis hier.